The year is 1837. Taking orders from the Chief Military Secretary Col. Patrick Buchanan, a motley mix set off to Jubbulpore from Calcutta, in search of Xavier Mountstuart—a missing British poet. They are, the Special Inquiry Agent Jeremiah Blake, Lieutenant William Avery of the British East India Company, and their native aids Mir Aziz, Sameer and Nungoo. Will they find Mountstuart? Will they survive the road, the weather, and above all, the mysterious forces plotting against them, ensnaring them from all sides like the strangler vines? 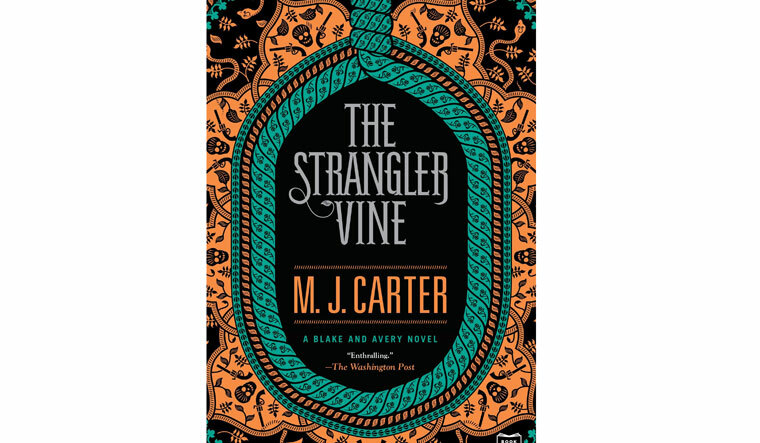 This is Miranda J. Carter’s historical mystery, The Strangler Vine (2014); her first work of fiction and also the first of her Blake and Avery series. Xavier Mountstuart was researching on the Thuggees, when he disappeared from Central India in 1837. Who are the Thuggees or alternately, the Thugs? Historical documents tell us that the British had by then identified the Thuggees as an organised cult who worship the Hindu goddess, Kali. In popular mythology, the modus operandi of the Thuggees is as follows: they befriend travellers in highways, gain their trust and eventually strangle them, taking away their possessions and burying their bodies. A Thuggee and Dacoity Department was set up by the Company in 1835 to suppress the Thuggees. Major General Sir William Henry Sleeman of Jubbulpore headed the institution from 1835 to 1839. The company had also passed a series of ‘Thuggee and Dacoity Suppression Acts’ between the years 1836 and 1848. These were precursors to the ‘Criminal Tribes Act’ of 1871, under which many of the ethnic and social minorities in India faced systemic oppression. Many communities in India still bear the brunt of these Acts. Jeremiah Blake—Carter’s radical, irreverent and polyglot agent, a white-man-turned-native in rebellion against the colonial values—has all the reasons to believe that Major Sleeman knows more about Mountstuart’s disappearance. William Avery distrusts Blake, for Blake appears erratic and secretive, just as his superiors from Calcutta had warned him. The party reaches Jubbulpore but finds a hostile, non-cooperative Sleeman. Yet, Blake and Avery investigate the Thuggee prison in Jubbulpore and draw some conclusions. While Blake’s sources are mostly the natives, Avery has to rely on the British officers for information because he only speaks English. They further journey to the Princely State of Doora, to meet the Prince Vishwanath Rao, a friend of Mounstuart. Events after events unfold, from then on. Avery starts trusting Blake, they find Mountstuart and they survive an attack of the Thuggees. But, everything changes while they are on their way to Mirzapur to meet Lord Auckland, the Governor General of India. They could not trust anyone else with the disturbing truths that they had found about the Thuggees and the British East India Company. And that is the crux of The Strangler Vine. Carter, a trained historian, has relied on historical documents to develop her plot. Many historical figures such as Fanny Park, Henry Derozio and Sir William Macnaghten, and of course Major Sleeman and Lord Auckland, find their place in the story. The ‘Historical Afterword’ which Carter provides at the end of the novel is a useful summary of the events that throws light on the actual lives Park, Derozio, Macnaghten and Sleeman had led. The atmosphere is brilliantly set and the narrative voice of William Avery is convincing. Carter finley weaves myth and history, fact and fiction, and life and politics in India during the Victorian era. Most importantly, she presents the problems and politics of ‘othering’ and the meanings we lose in translation, in a subtle way. All of these masterful components make The Strangler Vine, a compelling read.